What is an ISRC and why do I need them? The International Standard Recording Code (ISRC) is the international identification system for sound recordings. Each ISRC is a unique and permanent identifier for a specific recording which can be permanently encoded into a product as its digital fingerprint. The ISRC provides the means to automatically identify recordings for royalty payments and, in many territories, is increasingly becoming a tool in the fight against piracy. By identifying all sound and music video recordings that are released, regardless of the format that they are released in, the ISRC enables the tracking and tracing of these recordings through the music value chain. DSPs like Spotify, iTunes, Pandora, Amazon and many more all require an ISRC for every recording submitted to their platform. ISRCs are also becoming increasingly requested by production and media companies as a standard way to accurately track the usage and performance of recordings in their productions. How do I buy and assign ISRCs via SourceAudio? Anyone with an active site on the SourceAudio platform can instantly buy blocks of ISRCs from within their Admin Panel. Just go to Admin Panel > Add Ons & Tools > ISRCs to get started. ISRCs are a "standard" field on the SourceAudio platform so when you're on the new ISRC tab, we will display for you the total number of tracks you have on your site + the total number of ISRCs you already have assigned to your recordings. This will help you determine exactly how many ISRCs you'll need to buy if you want to make sure every recording on your site has this unique and standardized identifier. To proceed with purchasing and downloading your ISRCs, enter the number of codes you wish to buy in the "Purchase" field. Click the "Checkout" button, complete the payment information section, and you're finished. Your ISRCs will be instantly downloaded in a CSV and a copy of the spreadsheet containing your ISRCs will also be emailed to you. To assign your new ISRCs to your tracks, use your metadata spreadsheet export tool to grab a full dump of your current metadata on your site. Then, copy and paste your new ISRCs into this main metadata spreadsheet, associating each one with a track on your site (if you already have an ISRC field just paste them in there; if you don't have an ISRC field just simply create a new column called "ISRC" and drop them into this new field). How you choose to assign the numbers is totally up to you; you can put them all in sequential order or you can make it random -- there are no rules when it comes to associating new ISRCs to recordings that don't already have one. When you're done pasting your ISRCs into your main metadata spreadsheet save the CSV, upload it via your metadata spreadsheet import tool, and you're done! One quick rule when it comes to assigning ISRCs: If you already have an ISRC for a track/recording, don't change it. Hang onto it. Each track should retain its original ISRC forever. How much do ISRCs cost? If you buy ISRCs direct from the US ISRC Agency you'll pay $80 up front + $150 for every 1,000 ISRCs (or $0.15 each). Other online services out there charge as much as $1 per ISRC. 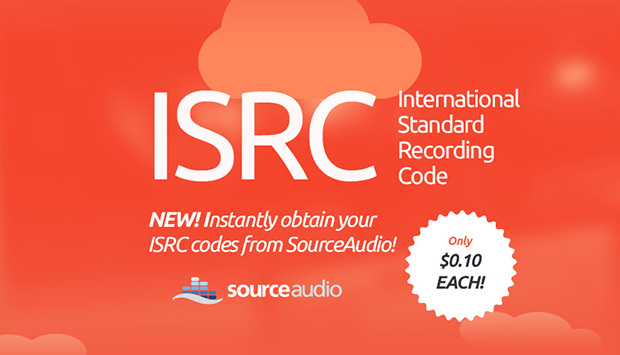 With SourceAudio you pay $0 up front and each ISRC is just $0.10 a piece. We ask that the minimum transaction be at least $10, due to our credit card processing fees on micro-transactions, but you can hang onto any unused ISRCs -- because they're yours -- and assign them to tracks at a later time. Do I own my ISRCs forever? Yes. We have obtained a giant block of ISRCs from the US ISRC Agency and can officially administer the codes but once you buy your codes and associate them to your track(s), your ISRCs will never need to be updated or changed no matter where you have them hosted. ISRCs are a great way to identify your recordings on any platform or medium so if you don't have yours already, go get your ISRCs today!